Semiconductor equipment maker Kulicke and Soffa has had quite a run of late. Since bottoming on March 27th the stock has finished in the green eight of the last nine sessions. Today KLIC is heading for new 2019 highs and will likely print its first close above $24.00 since late September. With today’s nice gain the stock is now up 11% from the March lows and is setting up well for more upside. 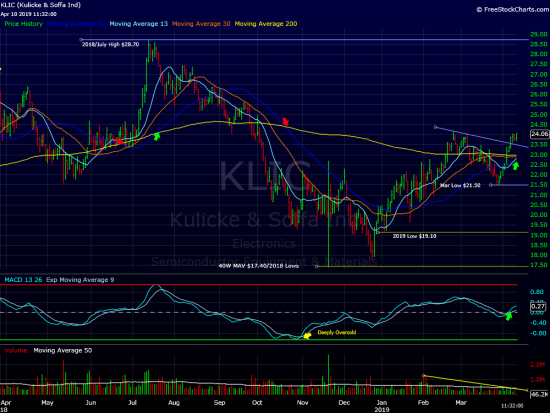 Last Friday KLIC broke through a key overhead trendline that linked the last two monthly highs. A very supportive moving average swarm is brewing underneath. By next week the 50 day moving average will have crossed(golden) above the 200 day moving average. KLIC sports a very high short interest ratio(7.1). This will add considerable upside fuel if shares begin to put some distance on the 2019 highs($24.15). Immediately following KLIC’s Q1 earnings release(beat EPS/revenue estimates) on January 31 shares gained 4.5% on the heaviest upside trade of 2019. Since then upside trade has been rather disappointing. KLIC is due to report Q2 results on May 2nd(PM). We regard KLIC a low risk buy near current levels. A close above the $24.15 area(Feb. high) will be a key hurdle. On the downside, a close back below $21.90 would violate last week’s low(April low) sending a clear warning sign that the Friday breakout has failed. At time of publication we are long KLIC in some managed accounts.